Listeners Got Active About Our Active Learning Stories : NPR Ed Two recent reports on a Stanford Noble Laureate's efforts to change how undergraduate science education struck a nerve with many of you. 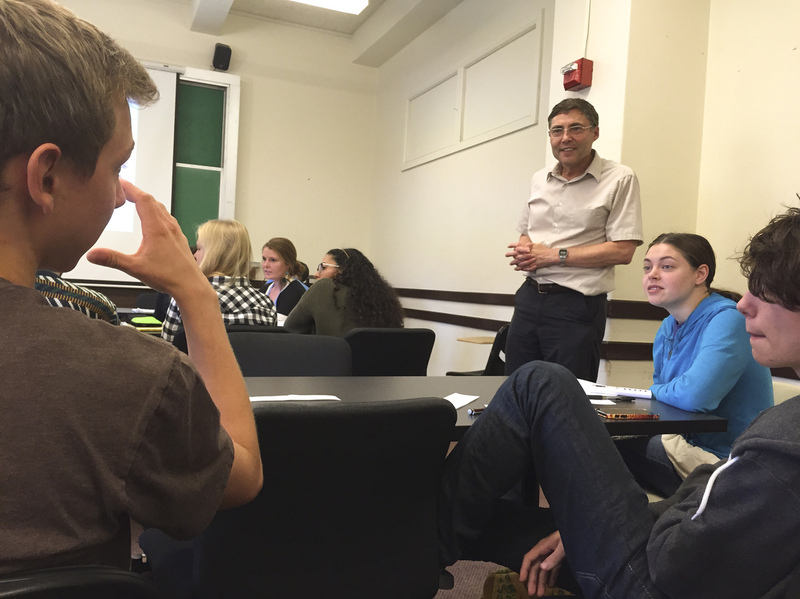 Dr. Carl Wieman listens in on a small group discussion during his introductory quantum mechanics course at Stanford University. Professor Carl Wieman is a huge proponent of ditching the large lecture in favor of evidence-based, active learning techniques. Several studies have shown that these methods boost student learning, grades and knowledge retention, reduce failure rates and even improve attendance. "If the data says it improves learning, you ought to seriously be thinking about doing it," Wieman told me. We wanted to follow up on some of the most-frequent issues you asked about. The stories focused mainly on science, technology, engineering and mathematics (STEM) subjects. Do active learning teaching methods work as well in the humanities and social sciences? Yes, advocates say, taking a student-centered, collaborative approach works, whether the topic is quantum mechanics or Proust. Wieman is convinced that active learning techniques would apply in the same way to undergraduate humanities classes, whether literary analysis or deep reading of history texts. "It turns out a lot of the general aspects of expertise are really the same across all these different fields" he says, including "how you organize knowledge, how you make decisions about what's useful and not useful and [how you] carry through a reasoning process and test conclusions." All the research, he adds, shows that the brain learns these kinds of reasoning skills in a pretty consistent way across many different disciplines. "And if you have students practice and get feedback," Wieman adds, "I'm just certain they're going to show the same kind of differences compared to getting lectured on it that we see in the STEM disciplines." We just need more data, he says. "The humanities people will take great issue with this, but for me it's just a question of getting them to collect data on this." Other educators are skeptical. Molly Worthen, an assistant professor of history at the University of North Carolina at Chapel Hill, makes a strong case for the value and power of the classic humanities lecture. She's firmly against jumping on any active learning bandwagon and hand-held clicker data collection. She wrote last fall in an op-ed in The New York Times: "In the humanities, there are sound reasons for sticking with the traditional model of the large lecture course combined with small weekly discussion sections. Lectures are essential for teaching the humanities' most basic skills: comprehension and reasoning, skills whose value extends beyond the classroom to the essential demands of working life and citizenship." A listener in our comments section, who goes by "JH" agrees, writing that while the use of more active learning techniques is heartening, the college lecture is getting unduly maligned. Lectures, JH writes, "have many excellent benefits that purported 'active learning' can't offer: 1) Students write notes. They learn both how to write and how to take notes. Writing is a skill that almost all students need to improve. 2) Students are presented with a detailed outline of the topic. This detailed outline is an explanation of how to categorize and organize information — a skill that for most students, needs a lot of work." Fair enough. The college lecture is dead. Long live the lecture. We focused on higher ed. But don't active learning techniques work as well in K-12? An educator, whose NPR.org screen name is George Emil (Hmm, there is a famous cell biologist named George Emil Palade), wrote that active learning methods, for him, are applicable mainly for his top-performing K-12 students. "The independent problem solving is great with students who are literate, numerate, and who desire to learn," he wrote. "I use that approach frequently with my higher achieving students. With the other chunk of kids they will sit there and hang out, not even talk about the problem, if you give them an inch of freedom." But David Clarkson, a veteran high school biology teacher in Hood River, Ore., wrote me that he and his colleagues have been have been inspired by the Next Generation Science Standards, benchmarks adopted by several states, including Oregon. They're using the standards, known as NGSS, to reinvigorate freshman and sophomore science courses around active methods, including breaking up classes into smaller groups to grapple with data, key questions and concepts. The school's goal, Clarkson says, is now to increase that active science classroom time "from roughly 25 percent to 70 percent." The whole goal of NGSS, Clarkson writes, "is for students to look, do and think as scientists as much as possible." A reader who goes by kbpole, who seems to like snark with his morning coffee, had a more strident take. "Are you serious, NPR? Any respectable K-12 teacher practices active learning every single day — small groups, large groups, jigsaw activities, fishbowl discussions, silent discussions, Socratic seminars, project-based learning, lit circles, independent reading and research projects, hands-on labs, field trips, interdisciplinary team teaching, and the list goes on ... If colleges and universities want to learn how to teach, take a look out the window of that ivory tower." Easy KB. Decaf. Your teaching experience may not be universal. Lo, O that it were. How Widespread? Only A Handful? Shocked! "The results at our college support the findings that active learning is superior," wrote John Courtmanche, the editorial director at Hampshire College in Amherst, Mass. He notes that the iconoclastic school — no majors, grades, or SATs -- was founded "specifically to dethrone the college lecture and enable students to drive their own education." He added that, "after 45 years practicing a model of active, project-based, experiential learning, we have five decades of results to prove it works." But Hampshire and other small, liberal arts schools are really outliers. As I wrote, evidence-based active learning practices are not yet widespread. We interviewed people from Stanford, University of Colorado Boulder and the University of British Columbia, and I wrote that beyond those, really only a handful of other universities — mainly at the department level — have adopted these teaching methods in a major, sustained way. James van Howe, an associate professor of physics at Augustana College in Rock Island, Ill., strongly disputed that assertion. He wrote that the series "neglects a significant portion of the higher-ed landscape — liberal arts schools, such as the one where I teach" where "many professors have been implementing active learning techniques since the late 1990s." But after some research, van Howe conceded that "we really are just a 'handful.' "
He added that, "In my community and group of schools, I would wager that most (if not all) of us are participating in empirically verified techniques for teaching." But, he continued, "I was shocked" that it was such a small part of the higher education landscape. Are colleges and universities measuring which teaching methods are most effective? I'll let Carl Wieman have the last word on this one. He told me that when he was Associate Director for Science at the White House Office of Science and Technology Policy from 2010 to 2012, he polled higher ed leaders and asked them: "Are any of you collecting data on the teaching methods being used in your classrooms and which ones are most effective?" The response, Wieman says, was that "none of them are." Until these schools see teaching effectiveness as something important to carefully measure, he says, the teaching "is not going to get any better. And they're not measuring it right now."